With the Marine Corps on the hook for some of the planned F-35C carrier strike group deployments, “we rebalanced this year with more Cs – just really more to catch up. Now that we have begun training our first F-35C squadron up in Lemoore, we will be the second carrier deployment with the United States Navy with our F-35Cs,” Rudder said. The Navy’s Strike Fighter Squadron (VFA) 147 will conduct the first deployment with the F-35C integrated into the carrier air wing, and Marine Fighter Attack Squadron (VMFA) 314 will conduct the second F-35C carrier deployment. Rear Adm. Scott Conn, the Navy’s director of air warfare (OPNAV N98), said at the hearing that the Navy and Marine Corps would continue to rotate which service transitions the next squadron to the F-35C until about 2026 or 2027. The Marine Corps hasn’t changed how many of each variant it plans to buy, but the new emphasis on F-35Cs and a slowing of F-35Bs will allow the small service to keep up with the latest squadron transition and deployment plans. To support accelerating F-35C acquisition, the Marines will decelerate F-35B procurement, “deferring several F-35B aircraft into future [low-rate initial production] contracts in order to balance concurrency management while taking advantage of emerging future technologies and capabilities,” Harrison said. That balance of models still heavily favors the F-35B that will operate from amphibious assault ships, but Rudder said the commonality between the B and C will give the service flexibility to move pilots and maintainers between B and C squadrons and will reduce the training and maintenance burden. Previously, the Marine Corps operated three types of fixed-wing aircraft: the EA-6B Prowler electronic attack aircraft, the AV-8B Harrier vertical landing strike aircraft, and the F-18 Hornet fighter. Each had its own separate training pipeline for pilots and maintainers and a separate logistics chain for spare parts. “What that means is, for our small 18 squadrons … we’ll be able to mix pilots back and forth between the B and C; one simulator. One maintainer, one supply account. And that creates efficiency for us,” Rudder said. 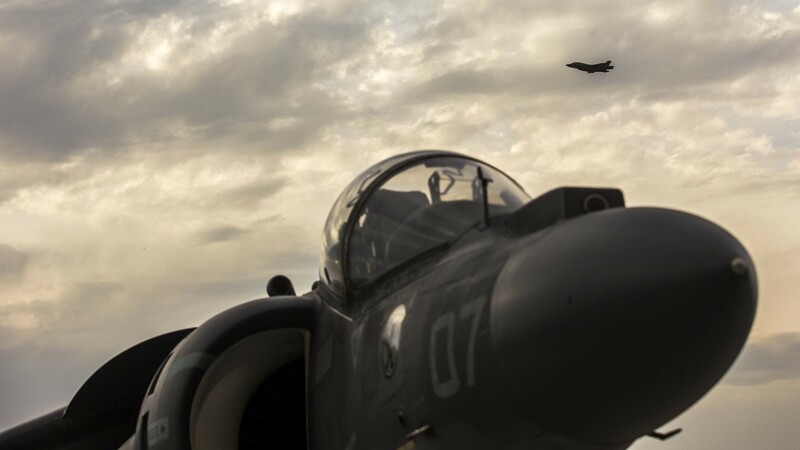 Rudder said that today, the Marine Corps has about 80-percent fourth-generation aircraft – Harriers and Hornets, with the Prowlers retiring last month – and 20-percent fifth-generation aircraft. That 80/20 balance will have reversed by 2028, and by 2030 the Marines should be fully into the F-35 for all its fixed-wing squadrons. Whether his Marines are on amphibs in the F-35B or on carriers in the F-35C, Rudder stressed the importance of the Joint Strike Fighter for potential future fights.